Thirteen years ago, my cousin asked me to be her soon-to-be daughter’s godmother. This particular cousin came into my family by marriage. We don’t do very well of keeping track of how we’re all related anyhow. We’re just cousins. It’s only confusing when we try to explain it to strangers because no one actually knows whether we’re first, second, removed or in need of some other term that no one seems to know. Such is the family that Jen married into to become my cousin. Jen is a wonderful Jewish woman who brought her faith into our Christian family. When we gathered for Christmas, she would teach us the prayers to light the menorah. It was so magical to me. I loved the years when these sacred holidays overlapped. I loved lighting the menorah before going to worship on Christmas Eve. So, when my beautiful cousin and her husband Rob prepared for their first daughter, they made plans to combine their faiths. They would raise their daughter to be Jewish but this same little girl would also share in the same magic I remember on Christmas. That’s not all. She would have something that no other Jewish girl would have. She would have a godmother. Maddy is my first goddaughter. She was my goddaughter before I was ordained. She watched me become a minister and then move far, far away. I haven’t had the blessing of being an active presence in her daily life or the her faith life. I hate that. I have only seen Maddy when the family gathers even though Jen and Rob chose me because I “would always be there.” This was heavy on my heart this weekend as I watched my beautiful goddaughter become a bat mitzvah. 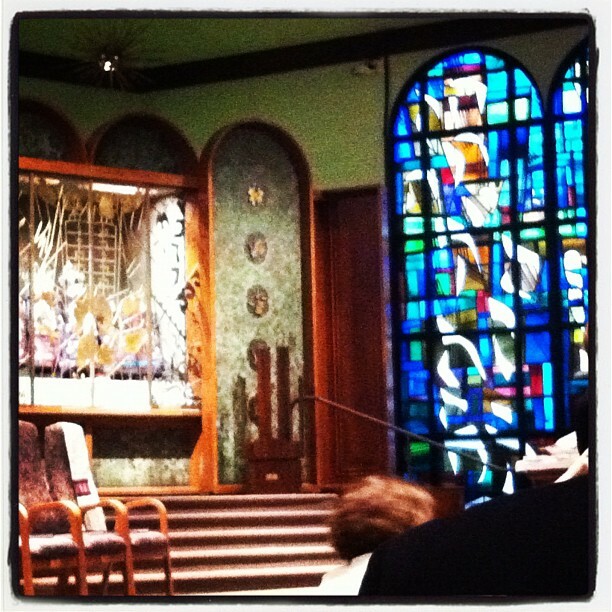 I cried as the Torah was passed from her grandfather to her mother into Maddy’s loving hands. My mind raced to Confirmation next Sunday. We don’t pass our holy text in such a ritual way from one generation to the next. Maybe we should. Maybe we shouldn’t. But it is what I get to do as a godmother. I might not get to touch the sacred scrolls but I will tell Maddy those stories. I will tell Maddy to write those words on her heart. It’s something that I hope for every confirmand next Sunday — but this is one of those strange moments where I realize that those aren’t my kids. That sounds terrible, doesn’t it? I may talk a lot about the family of God and how we are all related but there are some people in the world that understand you better just because they will stand beside you baffled that a stranger can’t understand how you are related — but you are. It’s not that I don’t love the kids that I serve. They’re just not my goddaughter. I might cry when they are confirmed but those are not the same tears that I cried for Maddy. On Saturday, I held my hands in a very Christian posture as the rabbi offered a blessing on my Jewish goddaughter. I’m used to offering that blessing. My hands go into that formation without thinking but thirteen years ago, I never would have imagined how warm my hands would feel in that moment.